In this thesis, I have made a study on hinterland connections. 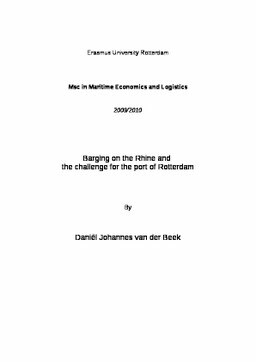 The emphasis is on the barging problem in the port of Rotterdam. Barging is one of the transportation modalities that is gaining share, and is expected to gain more due to its competitive advantage over the other modes and the fact that it is the preferred mode of the authorities in the Netherlands because of its environmentally clean characteristics and the fact that it does not clog up the transport infrastructure on roads and railways. Within the port however, there is quite some congestion due to barging. The reasons for this lie in the fact that the developments in barging over the Rhine are rooted in the history and the upcoming of the container trade by barge. Historically the way barging is organised does makes sense with respect to optimisation of freight consolidation in the hinterland, but in the port because of the grown volumes the situation is far from optimal. This congestion is harmful for all actors in the transportation chain, as extra costs are incurred as a result of the delays, and affects the overall competitive position of the port of Rotterdam. I have looked into different configurations that could solve the congestion in the port without affecting the hinterland haulage. Hereto six different models of barging have been proposed and analysed. The main difficulty encountered in the modelling consists of the trade off between extra costs involved and the gain of efficiency. This proves that the ideal solution is probably nowhere to be found. Although the modelling sounds quite straight forward on paper, I have found that the difference between theoretical and practical solutions can be large. A better solution will make all parties better off eventually, but it remains to be seen who will be willing to invest, and to be the first to change the current calling patterns. The implementation of the theoretical models can therefore not be used without further studies, but the urgency on the ground, if the container transport will pick up again might push the actors involved towards the adoption of a quick solution.